My Aunt Jill just got me this new totally boss shirt from REI. I love it. When she told me she had a gift for me back at their place, I was in the middle of a rant about how the sidewalk was only 4 feet wide, the road was 50 and yet we choose to stick all the obnoxious road signage on the sidewalk. We were walking back from El Mercado, mamboing between traffic signage on the narrow human easement while cars sailed by effortlessly on the wide boulevard. 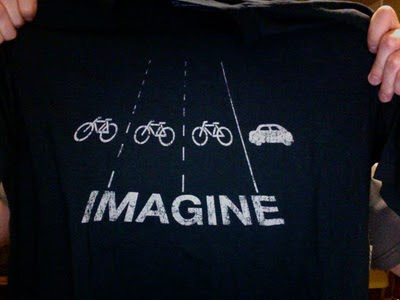 So, imagine indeed. And here's an awesome video from People for Bikes.